The United States on Thursday was to press Ukraine to end its two-month crisis after Russia warned its economically struggling neighbour that it risked losing a $15 billion bailout deal from Moscow. US Assistant Secretary of State Victoria Nuland was due to arrive in Kiev for a two-day visit for talks with Ukrainian President Viktor Yanukovych and the opposition. Her visit comes a day after one by EU foreign affairs chief Catherine Ashton, who said in Kiev that the government was not doing enough to overcome the ex-Soviet country's worst crisis since independence in 1991. 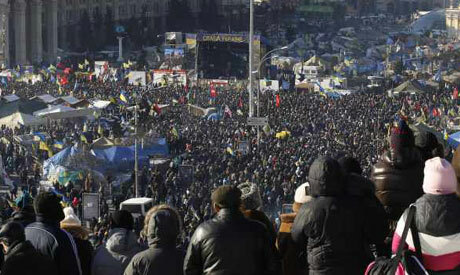 "I really need to feel a growing sense of momentum on this," she said in Kiev. Ukraine's unrest, which claimed the lives of several people, erupted in November after Yanukovych rejected an association agreement with the European Union under pressure from the Kremlin. The turmoil has now become an all-out movement to oust him. The crisis has also seen Ukraine's former master Moscow clash repeatedly with the West over the future of the nation of 46 million on European Union's eastern border. Russia agreed a $15 billion bailout for economically struggling Ukraine after Yanukovych rejected the EU agreement. Moscow has already transferred the first $3 billion tranche but warned on Wednesday Kiev risked losing the rest of the money. Yanukovych is expected to hold talks with Russian President Vladimir Putin on the sidelines of the opening of the Olympics in the palm-dotted Black Sea resort of Sochi on Friday. In a concession to the opposition, Yanukovych has already scrapped controversial anti-protest laws and dismissed the government but protesters on the streets are demanding early elections and Yanukovych's departure. Ratcheting up the pressure, Putin's spokesman Dmitry Peskov told Kommersant FM radio that Russia was awaiting the appointment of a new prime minister in Ukraine before releasing the $15-billion bailout package in full. "Of course, it will take some time before the new Ukrainian head of government is able to explain to Moscow how much he intends to keep to the previously-declared course," Peskov said. He also said Ukraine's gas debt -- estimated by Russian giant Gazprom this week at $3.3 billion (2.4 billion euros) -- was "growing very fast". Russia has twice in recent years turned off energy supplies to Ukraine over unpaid bills in what many analysts interpreted as political pressure on Moscow's former satellite. Buoyed by support from Western dignitaries, the opposition has accused Yanukovych, who faces an election in 2015, of dragging his feet in the worst crisis in Ukraine's history since the fall of the Soviet Union. Opposition leaders want parliament to amend the constitution to curb Yanukovych's powers, while protesters at Kiev's barricaded protest camp on Independence Square want him to resign immediately. "The political crisis continues," boxer-turned-politician Vitali Klitschko said in parliament on Wednesday as lawmakers failed to strike a deal on reducing presidential powers. The opposition planned Thursday to picket the building of the Verkhovna Rada parliament where a new debate was expected. Former prime minister Mykola Azarov and the entire cabinet stepped down last month under opposition pressure and Yanukovych has 60 days to name a new government. Yanukovych's Regions Party on Wednesday said the nomination could come next week, while nationalist opposition leader Oleg Tyagnybok said it could happen as early as Thursday. Speaking in Kiev, Ashton said Brussels was ready to provide financial support to Ukraine but stressed that conditions would be attached. "This is not about large dollops of money," she said. EU enlargement commissioner Stefan Fuele, who is set to return to Kiev next week, said Wednesday that the EU would be ready to extend assistance "in case of a positive scenario." The crisis has seen the Ukrainian hryvnia slump and one banker told AFP residents had begun to "panic" and were scrambling to move their savings into other currencies, while businesses have been exporting capital out of the country. The hryvnia fell to 9.40 to the dollar during trading on the interbank market on Wednesday, from a rate of around 8.0 just last month. "There is no political solution going forward so it's quite clear that the panic has started," said Dmytro Sologub, an economist at Raiffeisen Aval Bank.